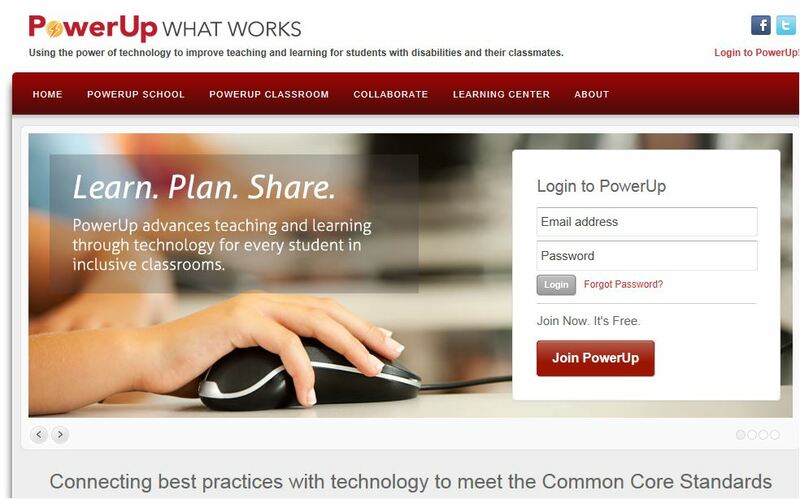 I want to share an excellent resource to support technology integration, the Center for Technology Implementation’s Power Up What Works website (http://powerupwhatworks.com). With funding from the US Department of Education, EDC, AIR, and CAST have partnered on this project to develop a comprehensive set of online resources for using technology to support literacy and math (of course, I have focused my attention on the literacy materials!). 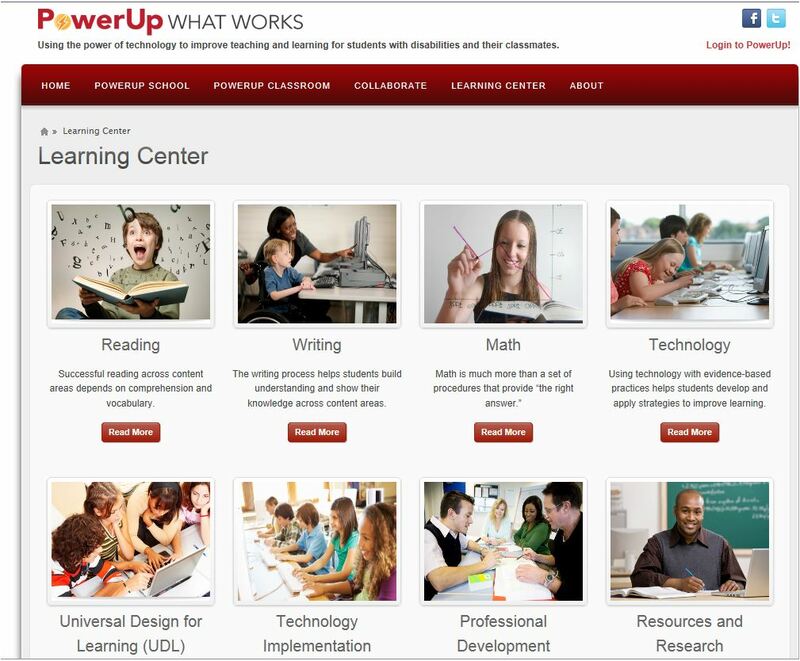 What makes Power Up unique is its special attention to the needs of students who struggle with learning, including students with special needs. As a member of the Power Up Advisory Board, I’ve had the opportunity to see the resource evolve and want to share a few of my favorite features. Did you notice that the blogger noted whether the resource was free and/or fee-based? I find this incredibly helpful, since like most teachers, I have limited funds and want to take advantage of the high-quality free resources that are available online. The Learning Center has a wealth of information and resources to explore. Since literacy is my thing, I’ve spent most of my time in the Reading and Writing sections. In Reading, the focus is on comprehension and vocabulary, while the Writing section focuses on supporting the writing process, from idea generation to publication. Throughout, you’ll notice the links to the Common Core State Standards. You can get information at the level and type that is useful to you. For example, each of the Reading sections includes an overview of the strategy (e.g., self-questioning, summarizing, visualizing, context clues, s semantic mapping and word analysis), a description of how to teach the strategy, an extended classroom example, a list of resources, research, and tech tips. Teachers are the ones leading the way on integrating technology into their teaching and their students’ learning. While teachers are ‘making it happen’, sometimes one classroom at a time, we know that more is usually required to sustain effective technology integration over the long term. 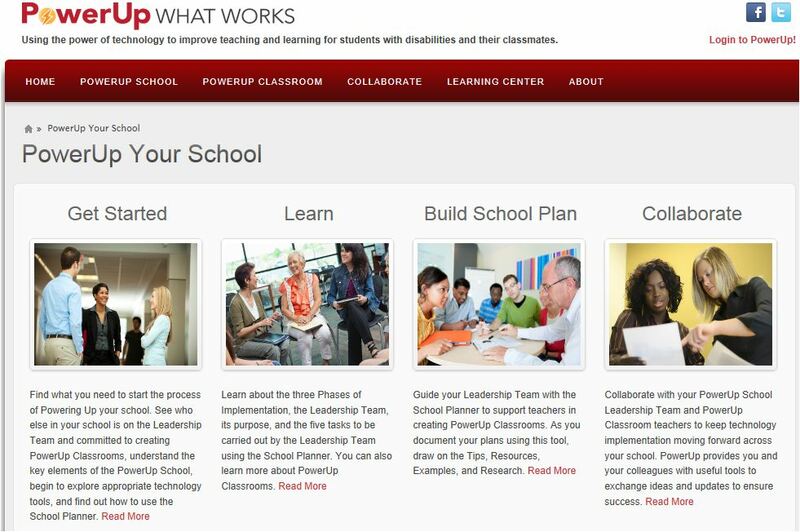 If your school is interested in developing a school-wide plan for integrating technology, Power Up offers a range of resources to support you in developing a school-wide plan and building a team that will work together to support one another in making technology a meaningful part of children’s learning. I know the Power Up team is eager for feedback, so let them know what you find especially helpful and share suggestions for improvement.